In the 1934 Brooklands 500 Mile Race (below), he AVERAGED 104.8mph around Brooklands including stops for fuel, tyres etc This was probably the most important race in Britain in 1934 along with the TT. He then repeated this in 1936 sharing the car with C.E.C. Martin and averaging a staggering 116.9 mph! Dixon scored many other successes in his career, finally leaving racing after a series of drink-driving offences. This race was for cars up to 1500cc (without superchargers), or 1100cc with. Freddie Dixon was in car 12, one of his Riley Specials, based on the Riley Works 33T racing cars. The circuit was 4½ miles long, with many sharp hairpins, and there were approx 60 laps in the race. Dixon started well, gaining 4th place early on. 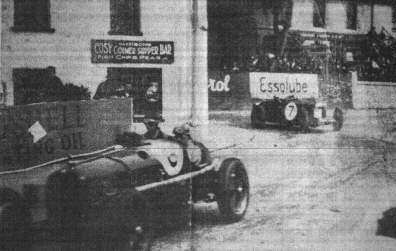 Then one by one, between the 16th and 31st laps the other contenders all dropped out, leaving Dixon with a clear lead. As was often the case in 1930's racing, only a half of the 14 starters completed the first 20 laps!, with 5 left at half distance, and only 2 completing the race! Dixon had set the pace in practice, when he completed a lap in 4mins and 36secs - an average speed of 60mph. In the race itself, he only managed an average of 54.41mph, although the race leader until lap 31, Hamilton, managed 57.58mph. Right: Dixon at Bray Corner,approaching from Stoney Hill too fast. He skidded his car completely round, and is seen pointing up the stoney, 1934 Mannia Beg. Below: Dixon following Hon. Brian Lewis (Alfa Romeo) at the Onchan Hairpin, 1934 Mannia Beg. The following year, Dixon entered the Mannin Moar as well - for cars over 1500cc, as he had enlarged his engine to 1808cc by now - he entered 2 cars, but he had to pull out with engine trouble. 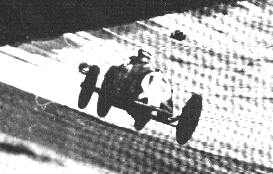 His teammate - Cyril Paul came 3rd, at 60.83mph. 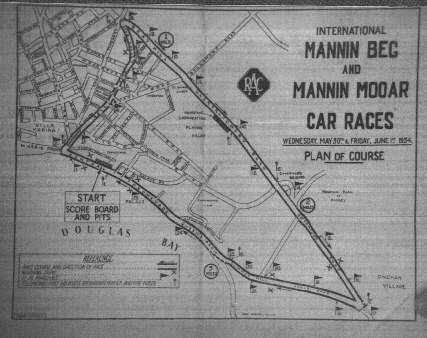 In the Mannin Beg, the following week, Dixon's Brooklands also had engine trouble, while Paul manged to gain 6th place over all. In the 1935 Mannin Moar Dixon completed the race, in second place. This info is based on an article in The Isle of Man Times, 1934.